In our ongoing effort to make StogieGuys.com as entertaining and reader-friendly as possible, each Friday we’ll post a sampler of quick cigar news and stogie-related snippets to tide you over for the weekend. (This one’s extra long due to the three day weekend…Yeah, baby!) We call ‘em Friday Samplers. Enjoy. 1) Cigar Aficionado is often associated with snobbish cigar reviews and articles about luxury items no one can afford, but we’ve uncovered some video footage that makes us believe CA founder Marvin R. Shanken knows exactly how to kick off his shoes and properly enjoy a good cigar with a fine bottle of wine. Presenting… A Master Class in Burgundy Wine and Cigars. Take good notes. 2) And while we’re on the topic of those dead-tree cigar publications, we’re glad to see that Smoke Magazine is covering the emerging trend of large ring gauge cigars by reviewing 26 stogies with ring gauges 50 and over, including six that are at least 60. Of course, we should point out that a while back we asked if sixty is the new fifty-four. 3) Last week we discussed the elusive pairing of booze and cigars and we mentioned that Blanton’s Bourbon was one of our favorites. Since we know you’re wondering if it’s really worth dropping $40 on a bottle of bourbon, we offer you a second opinion from Doc of Stogie Fresh. 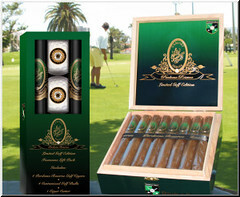 4) With cigar manufacturer after cigar manufacturer striving to implement creative marketing strategies to sell their stogies, a few are finally taking advantage of the perfect, age-old pairing to peddle their product – cigars and golf. The good folks over at Tabacalera Perdomo recently released a line called La Tradicion Perdomo Reserve Limited Golf Edition. The new blend is offered in eight sizes and sells from $4.50 to $10 apiece. A gift set named The Caddy is also hitting stores complete with four sticks, four balls, and a cutter. My only question is why didn’t this come out before Father’s Day? 5) Way back in May we told you how 38 states petitioned the federal government to reclassify little cigars as cigarettes. Why? Because, under current law, cigars can’t be taxed and regulated as heavily as cigarettes can. Well, the Montana Department of Revenue this week announced the state is considering new rules to regulate and – of course – tax “little cigars.” It’s yet another example of Big Brother taking advantage of disenfranchised, overtaxed smokers. 6) Finally, have a great Labor Day weekend! Thanks to Tropical Depression Ernesto, we’ll be spending most of our time indoors…but hopefully the weather is a lot nicer in your neck of the woods. Be sure to join us right here at StogieGuys.com on Tuesday, September 5 for our next post. Great video! That's hilarious. 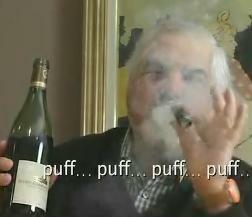 It's so funny to see a legend like Marvin Shanken enjoying wine and cigars like I do. I bet they filmed that one weekday before noon at the Cigar Aficionado office. I want to work there!